Another tick from the 2016 GBG and its the small but busy Golden Eagle just off Marylebone High Street. The clientele were mainly made up of couples of mixed ages. Seats to the front on Marylebone Lane were full as the weather on this visit was good. 4 ales on, fairly bog standard offerings but they did have Samuel Adams Blonde Ambition @ 4.5% on cask so that was my choice. Small red painted bar, dark red carpet throughout and nice stain glass windows to the front and sides. A very nice little pub that feels more like a local than a pub found in Central London and is another one that's worth seeking out, very calm and relaxing, a perfect stop for a pint. 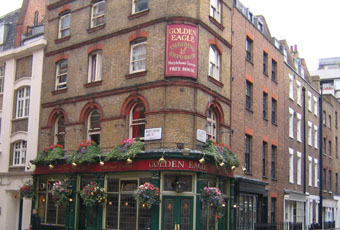 Its one of my last unexplored pubs in the camera book of pub crawls for Marylebone. Classic no frills old school boozer. London Pride decent at £4.25. Liked the fact it advertises itself as an imbibing emporium. Went here on Friday for the sing a long with the Piano, which is advertised for, Tuesday, Thursday and Friday, 8.30 till 11.00. The guy was there playing the piano, just sort of random background music, the sing a long did not happen, so we left. Skinners Cornish Knocker was decent, but the price £4.00!!!!! Its only a low ABV. Too expensive.